It is bounded on the north and west by the Atlantic Ocean; to the south by County Galway; the east by County Roscommon; and the northeast by County Sligo. 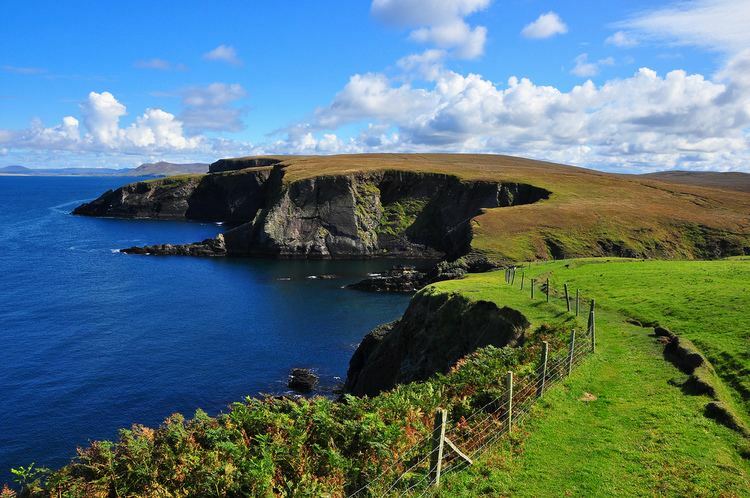 Mayo is the third-largest of Ireland's 32 counties in area and 15th largest in terms of population. It is the second-largest of Connacht’s five counties in both size and population. There is a distinct geological difference between the west and the east of the county. The west consists largely of poor subsoils and is covered with large areas of extensive Atlantic blanket bog, whereas the east is largely a limestone landscape. Agricultural land is therefore more productive in the east than in the west. Mayo County Council (Irish: Comhairle Contae Mhaigh Eo) is the authority responsible for local government. As a county council, it is governed by the Local Government Act 2001. 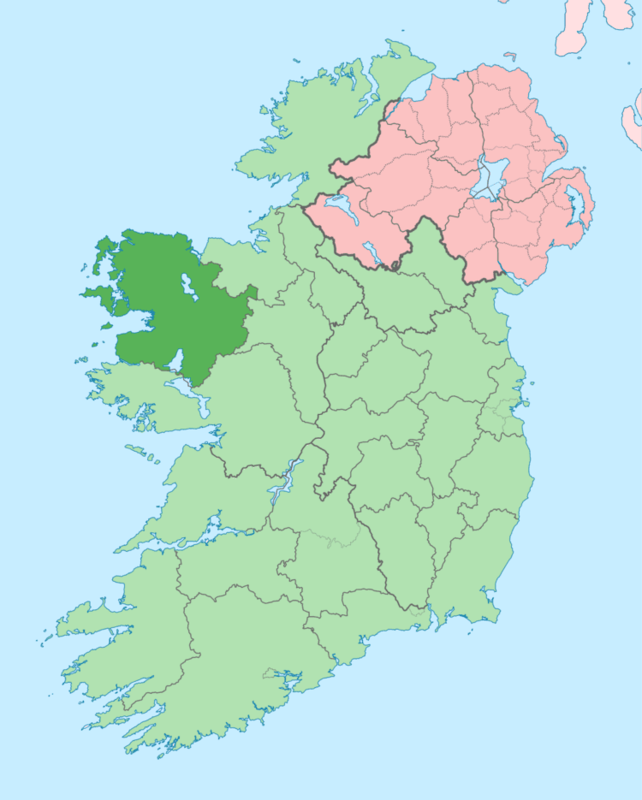 The County is divided into four municipal areas Castlebar, Ballina, Claremorris and West (an area which stretches from Westport to Belmullet). The council is responsible for housing and community, roads and transportation, urban planning and development, amenity and culture, and environment. For the purpose of local elections the county is divided into its four municipal districts, replacing the former six local electoral areas: Ballina (6), Belmullet (4), Castlebar (7), Claremorris (6), Swinford (4) and Westport (4). The county town is at Áras an Contae in Castlebar the main population centre located in the centre of the county. For national elections half of the Claremorris Municipal District is in Galway West and stretches from Ashford Castle to Ireland West Airport. Costello (east south east containing Kilkelly Ballyhaunis) etc. Christianity came to Ireland around the start of the 5th century AD. It brought many changes including the introduction of writing and recording events. The tribal 'tuatha' and the new religious settlements existed side by side. Sometimes it suited the chieftains to become part of the early Churches, other times they remained as separate entities. St. Patrick (4th century AD) may have spent time in County Mayo and it is believed that he spent forty days and forty nights on Croagh Patrick praying for the people of Ireland. From the middle of the 6th century hundreds of small monastic settlements were established around the county. Some examples of well-known early monastic sites in Mayo include Mayo Abbey, Aughagower, Ballintubber, Errew Abbey, Cong Abbey, Killala, Turlough on the outskirts of Castlebar, and island settlements off the Mullet Peninsula like the Inishkea Islands, Inishglora and Duvillaun. In AD 795 the first of the Viking raids took place. The Vikings came from Scandinavia to raid the monasteries as they were places of wealth with precious metal working taking place in them. Some of the larger ecclesiastical settlements erected round towers to prevent their precious items being plundered and also to show their status and strength against these pagan raiders from the north. There are round towers at Aughagower, Balla, Killala, Turlough and Meelick. The Vikings established settlements which later developed into towns (Dublin, Cork, Wexford, Waterford etc..) but none were in County Mayo. Between the reigns of Kings of Connacht Cathal mac Conchobar mac Taidg (973–1010) and Tairrdelbach Ua Conchobair (1106–1156), various tribal territories were incorporated into the kingdom of Connacht and ruled by the Siol Muirdaig dynasty, based initially at Rathcroghan in County Roscommon, and from c. 1050 at Tuam. The families of O'Malley and O'Dowd of Mayo served as admirals of the fleet of Connacht, while families such as O'Lachtnan, Mac Fhirbhisigh, O'Cleary were ecclesiastical and bardic clans. From AD 1169 when one of the warring kings (Dermot MacMurrough) in the east of Ireland appealed to the King of England for help in his fight with a neighbouring king, the response of which was the arrival of the Anglo-Norman colonisation of Ireland. County Mayo came under Norman control in AD 1235. Norman control meant the eclipse of many Gaelic lords and chieftains, chiefly the O'Connors of Connacht. During the 1230s, the Anglo-Normans and Welsh under Richard Mór de Burgh (c. 1194 – 1242) invaded and settled in the county, introducing new families such as Burke, Gibbons, Staunton, Prendergast, Morris, Joyce, Walsh, Barrett, Lynott, Costello, Padden and Price, Norman names are still common in County Mayo. Following the collapse of the lordship in the 1330s, all these families became estranged from the Anglo-Irish administration based in Dublin and assimilated with the Gaelic-Irish, adopting their language, religion, dress, laws, customs and culture and marrying into Irish families. They "became more Irish than the Irish themselves". The Anglo Normans encouraged and established many religious orders from continental Europe to settle in Ireland. Mendicant orders—Augustinians, Carmelites, Dominicans and Franciscans began new settlements across Ireland and built large churches, many under the patronage of prominent Gaelic families. Some of these sites include Cong, Strade, Ballintubber, Errew Abbey, Burrishoole Abbey and Mayo Abbey. During the 15th and 16th centuries, despite regular conflicts between them as England chopped and changed between religious beliefs, the Irish usually regarded the King of England as their King. When Elizabeth I came to the throne in the mid 16th century, the English people, as was customary at that time, followed the religious practices of the reigning monarch and became Protestant. Many Irish people such as Gráínne O'Malley, the famous pirate queen had close relationships with the English monarchy and the English kings and queens were welcome visitors to Irish shores. The Irish however, generally held onto their Catholic religious practices and beliefs. The early plantations of settlers in Ireland began during the reign of Queen Mary in the mid-16th century and continued throughout the long reign of Queen Elizabeth I until 1603. By then the term County Mayo had come into use. In the summer of 1588 the galleons of the Spanish Armada were wrecked by storms along the west coast of Ireland. Some of the hapless Spaniards came ashore in Mayo, only to be robbed and imprisoned, and in many cases slaughtered. Almost all the religious foundations set up by the Anglo Normans were suppressed in the wake of the Reformation in the 16th century. Pirate Queen Gráinne O'Malley is probably the best known person from County Mayo from the mid-16th to the turn of the 17th century. In the 1640s when Oliver Cromwell overthrew the English monarchy and set up a parliamentarian government, Ireland suffered severely. With a stern regime in absolute control needing to pay its armies and friends, the need to pay them with grants of land in Ireland led to the 'to hell or to Connaught' policies. Displaced native Irish families from other (eastern and southern mostly) parts of the country were either forced to leave the country, often as slaves, or (if they had been well behaved and compliant with the orders of the parliamentarians) awarded grants of land 'west of the Shannon' and put off their own lands in the east. The land in the west was divided and sub-divided between more and more people as huge estates were granted on the best land in the east to those who best pleased the English. Mayo does not seem to have been affected much during the Williamite War in Ireland, though many natives were outlawed and exiled. The general unrest in Ireland was felt just as keenly across Mayo and as the 18th century approached and news reached Ireland about the American War of Independence and the French Revolution, the downtrodden Irish, constantly suppressed by Government policies and decisions from Dublin and London, began to rally themselves for their own stand against English rule in their country. By 1798 the Irish were ready for rebellion. The French came to help the Irish cause. General Humbert, from France landed in Killala with over 1,000 officers where they started to march across the county towards Castlebar where there was an English garrison. Taking them by surprise Humbert's army was victorious. He established a 'Republic of Connacht' with one of the Moore family from Moore Hall near Partry. Humbert's army marched on towards Sligo, Leitrim and Longford where they were suddenly faced with a massive English army and were forced to surrender in less than half an hour. The French soldiers were treated honourably, but for the Irish the surrender meant slaughter. Many died on the scaffold in towns like Castlebar and Claremorris, where the high sheriff for County Mayo, the Honourable Denis Browne, M.P., brother of Lord Altamont, wreaked a terrible vengeance – thus earning for himself the nickname which has survived in folk memory to the present day, 'Donnchadh an Rópa' (Denis of the Rope). Newspapers in the county include the Mayo News, the Connaught Telegraph, the Connacht Tribune, Western People, and Mayo Advertiser, which is Mayo's only free newspaper. Mayo has its own online TV channel Mayo TV which was launched in 2011. It covers news and events from around the county and regularly broadcasts live to a worldwide audience. Local radio stations include Community Radio Castlebar, Westport Community Radio and M.W.R. (Mid West Radio). The documentary Pipe Down, which won best feature documentary at the 2009 Waterford Film Festival, was made in Mayo. The Mayo GAA men's team last won the Sam Maguire Cup in 1951, when the team was captained by Seán Flanagan. The team's third title, this followed victories in 1936 and 1950. Since 1951, the team have made numerous All-Ireland Final appearances (in 1989, twice in 1996, 1997, 2004, 2006, 2012, 2013 and twice again in 2016), though have failed on all occasions to achieve victory over their opponents. The team's unofficial supporters club are Mayo Club '51, named after the last team who won the Sam Maguire. The county colours of Mayo GAA are traditionally green and red. Richard Bourke, 6th Earl of Mayo – Viceroy of India 1869–72. Admiral William Brown (1777 to 1857) – born in Foxford, founder of the Argentine Navy. Patrick Browne (1720–1790) – doctor and botanist of Jamaica. Frank Carter – American serial killer. Brian Rua U'Cearbhain – 17th century prophet from Erris. Willie Corduff – Winner of Goldman Environmental Prize 2007. Jerry Cowley – GP of note. Michael Davitt – founder of the Land League, born in Mayo. The bridge to Achill is named after him as well as Castlebar's local secondary school (Davitt College). Frank Durkan – New York City human rights attorney best known for having represented numerous members of the Provisional Irish Republican Army (IRA), including avowed gun-runner and pivotal North American member of the IRA George Harrison, who stood trial, and was acquitted, in 1982 and Desmond Mackin – accused of shooting a British soldier. Michael Feeney, MBE – founder of Mayo Peace Park. Seán Flanagan (1922– 1993) – senior Fianna Fáil politician and Gaelic footballer. He served under Taoiseach Jack Lynch as Minister for Health (1966–1969) and Minister for Lands (1969–1973). Adrian Flannelly – Irish Radio Network host from 1970. Flidais – the heroine of the Ulster Cycle Erris legend of the Táin Bó Flidhais. Michael Gaughan – Born Ballina, Mayo 5 October 1949, IRA Volunteer, died on Hunger Strike in Parkhurst Prison, England, 3 June 1974. "Take Me Home To Mayo" ballad, written by Seamus Robinson about Michael Gaughan. James Owen Hannay a.k.a. George A. Birmingham – author of such novels about County Mayo as The Seething Pot (1905) and Hyacinth (1906). John Healy – author and journalist (1930–1991). Enda Kenny – politician, leader of Fine Gael since 2002 and Taoiseach of Ireland (2011–present). Tommy Langan (23 September 1921 – 22 September 1974) regarded as the greatest Gaelic football full-forward of all-time. John McDonnell (born 2 July 1938) – athletics coach. He has won more national championships (42) than any coach in any sport in the history of American collegiate athletics. Paul O'Dwyer – President of New York City Council, prominent New York City human rights attorney, supporter of Irish nationalism, and defender of several Irishmen from deportation, including "The Fort Worth Five" and Vincent Conlon. William O'Dwyer – mayor of New York City from 1946–1950. Bernard O'Hara (b. 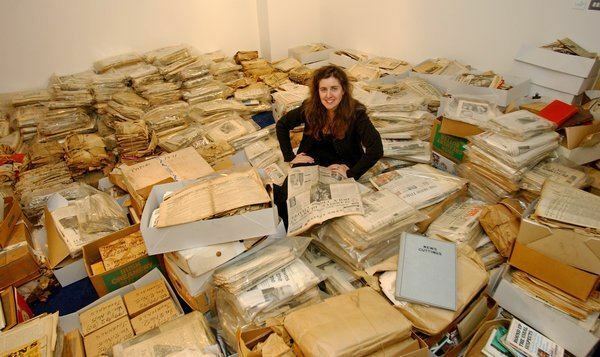 1945) – Irish historian. Gráinne O'Malley – 16th century pirate queen and chieftain of the clan O’Malley, also known as Granuaile. Ian O'Reilly, (Born in Moorehall, 1999) – Actor in hit Sky1 TV Show "Moone Boy"
Michael Ring – Fine Gael politician. Mary Robinson (born in Ballina, 1944) — first female President of Ireland (1990–1997), and United Nations High Commissioner for Human rights. Aoibhinn Ní Shúilleabháin (born in Carnacon in 1983) – winner of the 2005 Rose of Tralee contest. She is the 47th Rose and the first from County Mayo. John Solon – member of the Wisconsin State Assembly. Frank Stagg – Irish Republican Army. Hunger striker.